a drawing together; a shortening or shrinkage. Braxton Hicks c's see braxton hicks contractions. carpopedal contraction the condition resulting from chronic shortening of the muscles of the upper and lower limbs including the fingers and toes, seen in tetany. concentric contraction contraction resulting in shortening of a muscle, used to perform positive work or to accelerate a body part. It is metabolically more demanding than an eccentric contraction. Called also shortening contraction. eccentric contraction contraction in the presence of a resistive force that results in elongation of a muscle, used to perform negative work or to decelerate a body part. It is less metabolically demanding than a concentric contraction but may cause disruption of associated connective tissue with delayed soreness or frank injury if it occurs in an unaccustomed manner. Called also lengthening contraction. end-diastolic premature ventricular contraction a ventricular ectopic beat falling at the end of diastole; it may or may not be slightly premature and may or may not be a fusion beat. haustral c's muscular contractions of the wall of the large intestine during which the haustra can be seen more easily; called also haustrations. isometric contraction muscle contraction without appreciable shortening or change in distance between its origin and insertion. isotonic contraction muscle contraction without appreciable change in the force of contraction; the distance between the origin and insertion becomes lessened. postural contraction the state of muscular tension and contraction that just suffices to maintain the posture of the body. segmental c's muscular contractions of the small intestine that serve to mix and transport chyme. contraction stress test observation of the fetal heart rate in response to uterine contractions; see also fetal monitoring. tetanic contraction (tonic contraction) physiological tetanus. (kon-trak'shŭn), Do not confuse this word with contracture. 1. A shortening or increase in tension; denoting the normal function of muscle. 2. Shrinkage or reduction in size. 3. Heart beat, as in premature contraction. /con·trac·tion/ (kon-trak´shun) a drawing together; a shortening or shrinkage. Braxton Hicks contractions light, usually painless, irregular uterine contractions during pregnancy, gradually increasing in intensity and frequency and becoming more rhythmic during the third trimester. carpopedal contraction the condition due to chronic shortening of the muscles of the fingers, toes, arms, and legs in tetany. cicatricial contraction the shrinkage and spontaneous closing of open skin wounds. hourglass contraction contraction of an organ, as the stomach or uterus, at or near the middle. Isotonic (A) and isometric (B) contraction. isotonic contraction muscle contraction without appreciable change in the force of contraction; the distance between the muscle's origin and insertion becomes lessened. lengthening contraction a muscle contraction in which the ends of the muscle move farther apart, as when the muscle is forcibly flexed. paradoxical contraction contraction of a muscle caused by the passive approximation of its extremities. postural contraction the state of muscular tension and contraction which just suffices to maintain the posture of the body. shortening contraction a muscle contraction in which the ends of the muscle move closer together, as when a flexed limb is extended. tetanic contraction sustained muscular contraction without intervals of relaxation. uterine contraction contraction of the uterus during labor. wound contraction the shrinkage and spontaneous closure of open skin wounds. 1. The act of contracting or the state of being contracted. a. A word, as won't from will not, or phrase, as o'clock from of the clock, formed by omitting or combining some of the sounds of a longer phrase. b. The formation of such a word. 3. Physiology The shortening and thickening of functioning muscle or muscle fiber. 4. A period of decreased business activity. 1 a reduction in size, especially of muscle fibers. 3 (in labor) a rhythmic tightening of the musculature of the upper uterine segment that begins as mild tightening and becomes very strong late in labor, occurring as frequently as every 2 minutes and lasting over 1 minute. Contractions decrease the size of the uterus and squeeze the fetus through the birth canal. 4 abnormal smallness of the birth canal or part of it, a cause of dystocia. Inlet contraction exists if the anteroposterior diameter is 10 cm or less or if the transverse diameter is 11.5 cm or less. Midpelvic contraction exists if the sum of the measurements in centimeters of the interspinous diameter (normally 10.5 cm) and the posterior sagittal diameter (normally 5 cm) is 13.5 cm or less. Outlet contraction exists if the intertuberous diameter is 8 cm or less. See also clinical pelvimetry, concentric contraction, dystocia, eccentric contraction, x-ray pelvimetry. Cardiology A heart beat. See Premature ventricular contraction GI disease The shortening of the muscularis propria of the GI tract, resulting in peristalsis. See Giant peristaltic contraction Obstetrics The shortening of myometrial cells, resulting in ↑ intrauterine tension. See Braxton Hicks contraction Physiology A ↓ in muscle length, accompanied by ↑ tension. See Concentration contraction, Isometric contraction, Isotonic contraction. 2. A shrinkage or reduction in size. The primary function of muscle by which a change of shape brings the ends closer together. By contracting, muscles bring about movement of bones or other parts. The term comes from a Latin word meaning ‘to draw together’ so, strictly, a phrase such as ‘isotonic contraction’ is a contradiction in terms. Popular usage, however, will have it that a muscle can contract without shortening. A tightening of the uterus during pregnancy. Contractions may or may not be painful and may or may not indicate labor. n shortening or tensing of a muscle. 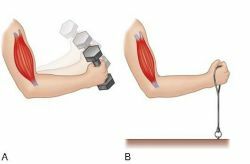 n movement accompanied by a shortening of the muscle as in the lifting phase of a biceps curl. n therapeutic technique involving contraction by a client of a target muscle against pressure applied by the therapist. See also contraction, isotonic. n a muscle contraction involving an external force which lengthens the muscle. Used to increase muscle strength and mass but repeated contractions may result in muscle damage. n therapeutic technique involving the lengthening of a muscle against pressure provided by the therapist. See also contraction, isotonic. n a muscle contraction that occurs against resistance while lengthening the muscle. n a muscle contraction in which the muscle tension increases without moving the points of muscle origin and insertion because a counterforce equal to that of the contraction is being exerted. n a muscle contraction in which the muscle length (shortening or lengthening) changes against a counterforce less than that of the contraction thus resulting in movement. n.pl the muscle contractions that occur as the client moves a joint and accompanying muscles through the complete motion against moderate resistance. (kŏn-trak'shŭn) Do not confuse this word with contracture. 1. Condition wherein maxillary and mandibular structures are closer than normal to median plane. 2. A shortening or increase in tension; denoting the normal function of muscle. 3. Shrinkage or reduction in size. n 1. a shortening, shrinkage, or reduction in length or size. 2. a condition in which teeth or other maxillary and mandibular structures, such as the dental arch, are nearer than normal to the median plane. n an unresisted ordinary shortening of muscle. isotonic, because the muscle changes length. n an increase in muscular tension without a change in muscle length, as in clenching the teeth. n an increase in muscular tension during movement without resistance (either lengthening or shortening), as in free opening and closing of the jaws. n the shrinkage associated with the congealing of a metal from its molten state to a solid after having been cast. See also expansion, thermal. n the development of tension in a muscle in response to a nerve stimulus. n.pl alterations in bands of striated muscle during contraction. Striated muscle is composed of a darker A band and a lighter I band. Both these alternating bands develop tension during contraction but not to the same degree. In isometric contraction (clenched teeth), the sarcomere muscle unit remains unchanged in length, whereas the A band (the darker band) actually shortens and the I band (the lighter band) lengthens. When a muscle is passively stretched, such as when the mandible is opened by gravity, the A band lengthens relatively more than the I band, and during isotonic contraction, almost all the shortening is in the A segment. It is thus concluded that the contractile properties are not the same throughout the sarcomere, which is the unit of contractility. It is suggested that the darker A band has a greater concentration of contractile substance than the I band and that, in addition to contractile elements, the I band contains elastic noncontractile elements that constitute a series of elastic components throughout the fibril. Thus there is, throughout a fiber, an arrangement of dark, contractile components alternating with lighter, elastic components. n.pl the chemical constituents and action involved in the contraction of muscle fibers. Muscle is a structure with working units built up largely from two proteins, actin and myosin, which appear to be organized into separate filaments running longitudinally through the muscle fibers. Neither type of filament runs continuously along the length of the fiber, although the effect is that of a continuous structure. The filaments are organized into a succession of groupings of one type of fiber. Each group is arranged in a regular palisade to overlap the next group of fibers, which are similarly arranged in palisades. This gives a banded appearance to the fiber. The thicker filaments contain myosin and are restricted to the A bands, where they give rise to a higher density and double refraction. The thinner filaments contain actin and extend to either side of the Z band, which is at the center of the I band. When the muscle contracts or is stretched, the two groups of filaments slide past each other like the alternating units of a sliding gate. The controlled sliding motion is presumably brought about through the mediation of oblique cross links between the filaments. These cross links are the structural expression of the biochemical interaction between actin and myosin. The chemical substance that initiates the interaction between these fibrils is adenosine triphosphate (ATP). The final effect of the interaction between ATP, myosin, and actin is to enable the two types of filaments to crawl past each other to create the shortened state of the muscle. n the maintenance of muscular tension (usually isometric muscular contraction) sufficient to maintain posture. n an extra heartbeat caused by premature contractions of the heart's ventricles resulting in palpitations, or a skipped beat, followed by a more pronounced beat. n the mechanisms that regulate the functions of smooth muscle fibers. These regulatory mechanisms vary and are affected principally by two methods. First, the parasympathetic and sympathetic nerve fiber endings of the autonomic nervous system form a reticulum around the muscle cells before entering them. The action of these fibers is antagonistic; they act directly on the muscle cell, not on each other. Examples of the structures principally under the control of the autonomic nerve mechanism are the blood vessels and the pilomotor fibers. Second, the selection response to rhythmic activity associated with the automaticity of a viscus or other organ depends on local or hormonal factors. An example of this mechanism is the function of the uterus under the control of the estrogenic hormone. isometric, because it develops tension without changing length. ventricular muscle contraction during early systole after closure of the atrioventricular valves and before the semilunar valves open; the muscle continues to contract, forcing up the ventricular pressure without any change in the ventricular volume. individual myocardial cells transmit motor impulses across cell boundaries and act as a syncytium. the stage in wound healing when there is centripetal movement of surrounding tissues and the area of the wound decreases. This is believed to be a cell-mediated phenomenon, involving myofibroblasts. the state of muscular tension and contraction that just suffices to maintain the posture of the body. sustained muscular contraction with alternating relaxation. In the process of investigating the effect of arsenic on blood vessels, we observed that arsenic could enhance agonist-induced contraction in an aortic ring organ bath system, suggesting that arsenic could disrupt contractile function in vascular smooth muscles as well. Since both lateral and expansion implied centrifugal motion, it might likely be the case that the same channels were stimulated while the contraction motion (centripetal motion) was tapping a distinct channel. In the past many continence therapists taught patients to minimise abdominal muscle activity during PFM training, but now the use of a TrA contraction to facilitate a PFM contraction is increasingly common. Anecdotal evidence found that political instability continued to undermine economic performance, with issues around security and cash flow also playing a part in the latest contraction. The frequency and force of spontaneous contractions were calculated from the recordings manually. The fourth chapter displays braille symbols and contractions according to braille dot numerical order. The sustained contraction of tonic muscle facilitates the determination of its force production. The insulin-induced tracheal smooth muscle contraction was significantly reduced in salbutamol-treated group from 351. 2+] channel on muscle contraction, we hypothesized that magnolol affect the colonic smooth muscle contraction mediated through the L-type calcium channels. At contraction levels above approximately 30% of maximum, the blood flow is completely obstructed (2). For example, previous researchers have reported that as contraction velocity increases, SEMG-AMP can either increase (plateauing at about 3000 s-1) (Coburn et al. Figures for April showed the region was one of only two in the UK to register a contraction in output in its Purchasing Managers' Index.